In 1889, France opened the Exposition Universelle, a world's fair that few thought could be surpassed. At the fair, the Eiffel Tower was revealed. The United States was determined to build something even more amazing. This would culminate in the 1893 World's Fair in Chicago. 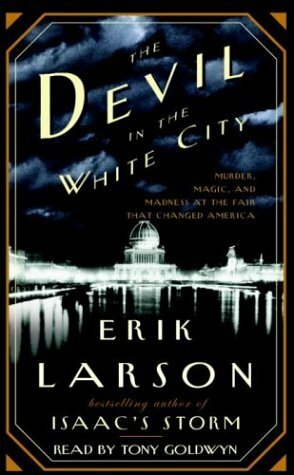 In The Devil in the White City, Erik Larson takes us behind the scenes of the development of this fair. At the same time, he profiles a serial killer, H.H. Holmes, who lured women into his lair just down the road from the fair. It's surprising that the fair ever made it off the ground. The team assembled to develop the fair had a string of issues along the way, mostly political. Everything ran later than expected. Construction on the buildings wasn't even begun until less than two years before the fair was to open ~ and it progressed very slowly. Larson provides a great deal of detail about the process that took place and the people who were involved. Their relationships were particularly interesting. But while this is nonfiction, his writing style feels much more like a fictitious novel. I had to remind myself many times that all of this was true. And that was especially difficult when he wrote of Holmes. To think that this madman actually did the things he details in this book is sickening. He was a true predator, luring people into his life, and then killing them for apparently no reason other than because he could. While some the facts of his actions were extremely disturbing, I will say that Larson wrote in a way that wasn't too graphic. And again, it read like a novel, so it was easier to imagine that this was just fiction. Overall, I thoroughly enjoyed this book and will absolutely check out other books by Larson. I look forward to discussing this one with my book club at the end of this month. This review was written based on a copy of The Devil in the White City that I obtained through Paperback Swap. I LOVED this book, LOVED IT. Couldn't put it down. I've heard mention that they are adapting this to film and Leonardo DiCaprio will star as H.H. Holmes, so that should be interesting. Such an incredible book and what a unique combination of the World's Fair with the first documented serial killer. That "house" he made is frightening, I wonder if it's still in Chicago, or if it's been torn down? I think Larson said in the book that it had burned down. The detail he went into with designing that building was amazing - in a really bad way! I was also amazed at Larson's writing! Easy to forget it's nonfiction while you are reading it. My husband just finished Larson's latest book, In the Garden of Beasts, which he also said was excellent. I loved this book! I read it for book club about 7 years ago and I still find myself occasionally talking about it. One detail that really stuck with me was how the conditions of living at the worksite on the workers had such a huge impact on one little kid there - Walt Disney - and you can see that influence to this day at his theme parks.